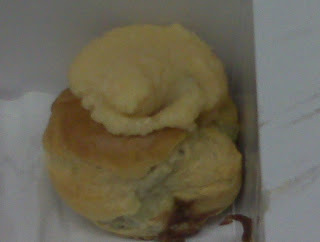 Another yummy treat from Paina Cafe. 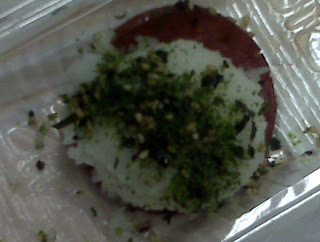 This is Jobo's Goteburg Musubi or "Jobo's" for short. It's Kauai's version of the spam musubi. They now serve it with brown rice if you ask. Gotegurb sausage (which is from Germany), rice and fukikake. So simple! 3 of these little things for $2.99 (or was it $3.99...oops). They go great with my favorite cup of soup! Foodie J tells me he cooks this for his family with eggs and rice (instead of portuguese sausage). Sounds delish to me.